In our article covering the basics of betting football props, we explained how football props are widely considered to be better suited to recreational bettors. This is because they are largely luck-based wagers. We also explained that it's possible to handicap certain types of football props, and that they shouldn't be dismissed by bettors serious about trying to make money. The key to making profitable football prop bets is ultimately in learning how to price them better than the bookmakers do. This is how you find value in them, and it's an art that we explain more in the article linked above. In this article we focus on a specific method that can be applied for pricing props – using Poisson distributions. 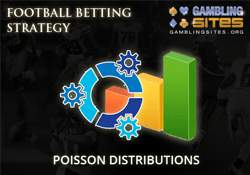 We explain what Poisson distributions are, and illustrate how they can be used when betting on football. In layman terms, a Poisson distribution is basically a method of quantifying the probability of random occurrences over a time period. It can only be used if an average number of occurrences over a period of time are known, and each occurrence is entirely independent of one another. Poisson distributions are most accurate when the expected number of occurrences is small while the opportunity for an occurrence is large. The average number of occurrences must also be proportional, meaning if the time interval doubled so would the number of occurrences expected. The Poisson distribution model was published by the renowned French mathematician Simeon Poisson, back in the 19th century. Unfortunately for the inventor of this model, he died before football was invented and he never got to experience the internet or online betting. Thankfully for us, his work has been well preserved, and his model is used today in a number of aspects of sports betting. It's extremely important to note that this distribution model isn't appropriate for pricing most prop bets. For example, if you were pricing how many rushing yards a player would have, this would give you a very out-of-whack figure and cause you to make -EV bets. They lack the randomness element required where each occurrence must be independent of the last. A player rushing one yard is more likely to take steps and rush another. The following is a list of criteria that must exist in a prop bet for the Poisson distribution model to work effectively. The opportunity for an occurrence must be large. The actual number of occurrences must be small. Occurrence must happen one at a time. Each occurrence must be independent and random. Number of occurrences over a time period (meaning, if the time period doubled so would the expected number of occurrences). These five criteria eliminate using Poisson distribution for all sorts of bet pricing. As we established, it can't be used for rushing yards due to the lack of randomness and the need for events to occur one at a time. It can't be used for passing yards for the same reasons. It also can't be used for number of completed passes, as these occur far too frequently per attempt. Scoring is off the list for football due to failing the proportional test. To show where it does work, we'll illustrate it's use in two specific types of football prop bet. Let's say we're shopping the over/under prop betting odds on total sacks in a game between the Giants and the Redskins. We see the following odds offered. Even though we understand that handicapping the market doesn't always work well for football props, we're going to choose to give the market credit. Based on our knowledge of the different bookmakers, and which ones are for recreational bettors and which ones are offering reduced juice, we conclude that it would appear the fair market price is around even money on over or under four sacks. The goal is now to determine whether there is any value in the lines of 4.5 and 5.5 being offered. We can figure this out using Poisson Distributions. The easiest way to do this is to use Excel, as you just need to use the following formula function. Cumulative is asking whether or not we're solving for a range. Here we are, so we enter "true". If we were looking for an exact probability of a specific outcome we'd enter false (for example exactly 5 sacks). Knowing the expectation is 4, to solve for 4.5 we head to Excel, pick any cell and enter the following. That cell now displays 0.628837, which we convert to a percentage of 62.29%. Go to our odds converter and enter in 62.29% in the implied probability field and you see in American odds format this is -165. If we're assuming that 4 is the true even money line, then the fair prices on over/under 4.5 are +165 for the over and -165 for the under. This would mean betting the over 4.5+ at +170 with Bookmaker A is a +EV wager, as the odds are better than the fair price. To solve for the 5.5 we enter the following. The solution converts to a percentage of 78.51%. Our odds converter tells us this is -365. So a no-vig line would be over 5.5 at +365 and under 5.5 at -365. Seeing as the bookmaker offering the 5.5 line has odds of +340 and -390 respectively, neither side is +EV as the odds are worse than the fair price. Here we're going to use an example of a real betting line found by one of our team back during the 2011/2012 playoffs. It was for the total number of interceptions in the game between the Detroit Lions and the New Orleans Saints. The total was set at 1.5, with the over available at -120 and the under at +100. This bet caught the eye because normally it is seen priced much higher, such as -160 for the over and +130 for the under. The natural inclination was therefore to immediately bet the over. With two passing teams, and a high betting total, there's going to be a ton of chances for interceptions. Being a professional bettor, our guy was not just going to trust his instinct so easily though. He investigated further. His first step was to head to pull the stats on season interceptions for each QB, each defense, and all defenses. From here he broke the stats down to per game averages as follows. Calculating a QB's expected interceptions per game means reconciling his figures against his opponent's defense. However, NFL seasons are short. With just 16 games in a season, it's important to normalize the defense data by incorporating league average into the equation. A formula that works quite well for this is as follows. Using the above formula resulted in the following expected interceptions for each quarterback. Adding these two together gives the expected total for the game, which is 1.733. From here, the next step was to see if this prop met the Poisson distribution model criteria. Is there a high number of potential occurences? Looking over season stats, each of these quarterbacks has averaged just over 41 pass attempts per game. This gives 82.3 expected trials. It's not a huge number, but close enough to give a fairly accurate estimate. Are the number of expected occurrences small? 1.733 expected occurrences / 82.4 expected trials = 2.1%. Again, while a little higher than is ideal, it's low enough to give a fairly decent estimate. Do the occurrences happen one at a time? Most definitely. A QB can't throw two interceptions on the same passing attempt. Are the occurrences independent of one another? For all intents and purposes, yes. However, one could argue a quarterback going on mental tilt could throw more interceptions out of frustration. Point noted, but again this should be close enough. If the game's length was extended would the number of occurences remain proportional? Without stretching it to fatigue, the answer is yes, they're proportional. The conclusion here is that Poisson won't be so accurate that a wager could be placed with a low edge, but it's accurate enough that a wager could be placed with a large edge. So the next step was opening up Excel and plugging in the following. This was solved to suggest that the chances of going under 1.5 were 48.3%. Using our odds converter, the fair prices came out at -107 for the over and +107 for the under. This was a case where knowing Poisson distributions saved an experienced and knowledgeable bettor from making a snap reaction -EV bet. As the game headed into the final ten minutes with no interceptions thrown, our guy no doubt felt great about having saved some money. As it turned out, however, math was to his detriment that day. Late in game Stafford was picked off twice, one of them coming in garbage time. This highlights a very important point though, and a perfect one to finish on. Beating props long term requires making +EV bets and avoiding -EV bets, not getting lucky. On the occasion described above, a –EV bet would have won. That happens sometimes. Equally, +EV bets lose sometimes. But the whole concept of expected value is based on the long run. If you consistently make +EV wagers then you should make profits over time. And Poisson distributions can help you to do exactly that with football prop bets.